← Normalised into Indifference: MBC etc. 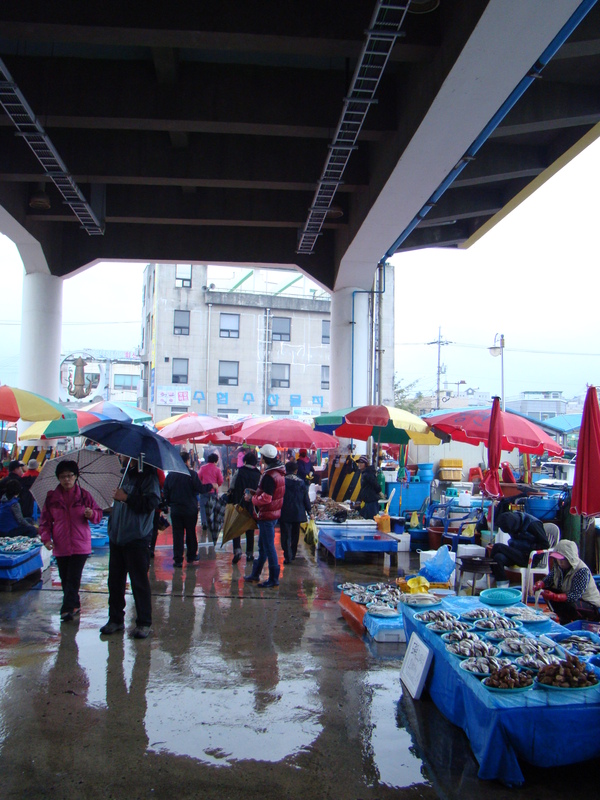 My Second Home in Korea – Jumunjin, Gangwon-do. 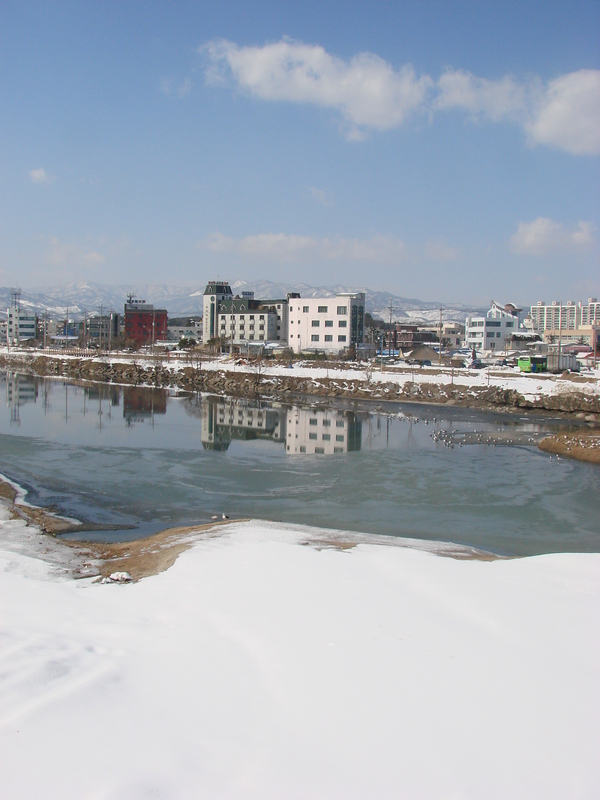 Sogum River and Jumunjin in the winter. Not only is Jumunjin the place where we later got married, it’s also probably the place outside of Seoul we visit the most. A couple of summers ago we were almost every second or third weekend. That being said, it has been a while since we were last out here. I’d say we haven’t been here since some time last autumn, which is quite a while. It was a nice feeling last night to drive in the dark along the almost empty expressway without a landmark in sight, except for the occasional rest stop and sign post for major towns. As we neared the three quarter way mark, the express way passes through a series of tunnels several kilometres long. When you emerge on the other side, you’ve essentially driven through a mountain. This time we came out in the middle of cloud. The weather had changed completely and the temperature had dropped by around ten degrees. After the long drive, the expressway sweeps downhill steeply to Gangneung and it is always from this point that I start to feel properly excited. This is where we celebrated after our wedding ceremony. Imagine this scene in June without a cloud in the sky. Of course, the main reason we come out here is pay a visit to Herself’s parents. Fortunately, and I say this from both our perspectives, we’ve made enough of a habit of coming out here that a visit doesn’t revolve around the typical smash-and-grab method of visiting parents as an adult. We’ve almost got our own routine here and Herselfs’ parents often just leave us to go about our own business until meal times. 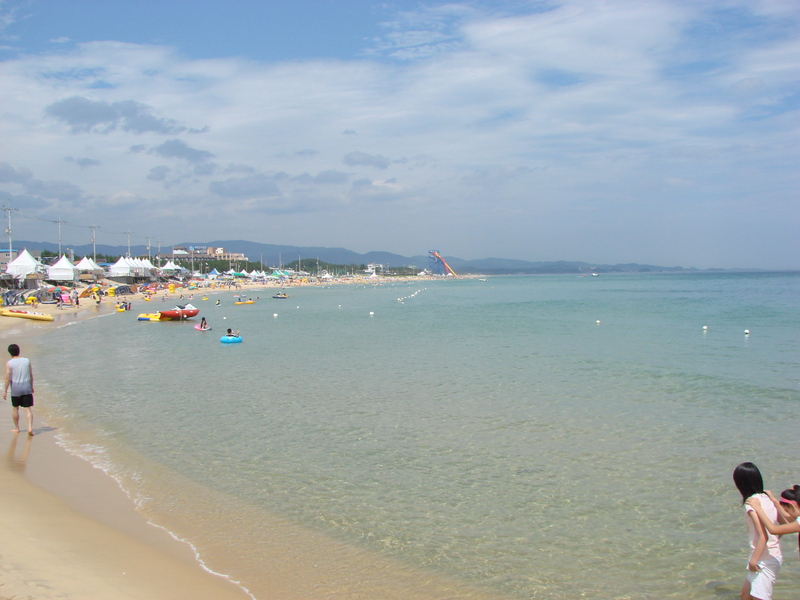 As Jumunjin is a small and rural fishing town, there’s not much happening most of the year outside of the summer months when the beaches are open and thousands of visitors pile into the many beaches in the vicinity of the town. As it’s a fishing town, opportunities here are limited for young people, and Herself’s friends have mostly moved to Seoul and have lived there for a long time. There’s a nice countryside laziness about, even if parts do look a little run down. Maybe this is what makes Jumunjin normal. It’s an old town that has had to sacrifice its youth to its traditions based in the struggling fishing industry. Ambition is not a trait suited to small places like this, and even with the increased numbers of tourists who cram the streets at the weekend, it’s no surprise that there is a distinct generation gap when you look at the people walking around and going about their business in the town. Places like Jumunjin are all over Korea, but all too often people forget that they exist because the bright lights and high-rise of Seoul obscure the reality for much of the country – and this includes large tracts of Seoul also. Not only do people dress very differently, but also the behaviour is quite different also. One pleasant difference is the pace of life is a lot slower, but if you’re a foreigner and you dislike being stared at I would advise wearing a blindfold. But at the same time, you’d be surprised at how open people are to other things you wouldn’t consider them to be. One thing about the countryside that you notice almost instantly is the people. Korea is an aging country, and most of the wealth is disproportionately balanced. Even then, wealth is displayed differently, and the sense of value is quite different from that of the major cities. There are very few expensive cars driving around and designer handbags being flaunted, which is a welcome difference from my own point of view. In Jumunjin, a lot of the town is survives off the struggling fishing industry. Even though there seems to be no shortage of fish in seafood restaurants around the country, there is a shortage in the sea. A lot of the fish there is either farmed or imported. There are a lot of boats in the harbour and always fresh fish on sale in the market, which makes getting up early always worth the effort. Despite the downturn in the main fishing industry, Jumunjin still has a bustle about it. The middle of the town is densely populated enough and there are still plenty of weekend visitors on tours who stop by the famous port for either some dried squid or raw fish, both of which Jumunjin is regarded as one of the best places in Korea to sample these. All this popularity has fuelled a boom in small tourist shops and also restaurants and more significantly, coffee shops. Probably one the most famous coffee shops in the country, Bohemian, is right around the corner from Herself’s parents apartment. And while you’d be lucky to get a seat (and some peace and quiet) over the weekend, the rising popularity of high quality roasted beans from specific locations has seen competing coffee houses spring up all around Jumunjin, but also all down the coast towards Jeongdongjin (famous as the place to catch the sunset after the overnight train from Cheongnyangni in Seoul). While I don’t really like Bohemian, I do like what it has done to Jumunjin and the Gangeung area. All down the coast on beaches that are often closed for nine months of the year, independent coffee shops that roast their own coffee are creating a new vibe. Right now, my favourite thing to do here is to leave my in-laws’ apartment and take the short stroll through old residential areas down to the beach and go for coffee while looking out onto the sea. I usually bring my camera, a notebook, something to read, and make sure to take my time. It is very relaxing. 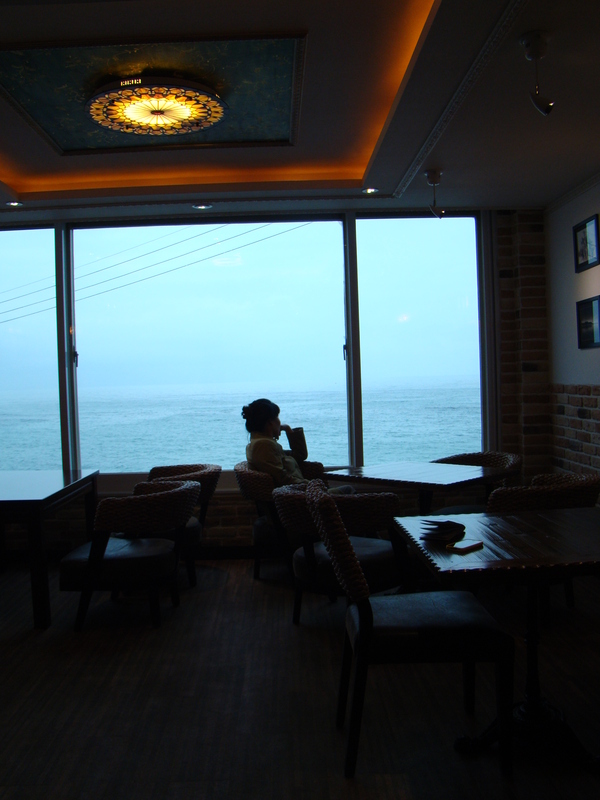 Taking in the sea in a Jumunjin coffee shop. Rural Korea is a different place to the cities that I have lived in. Despite struggling through a modernisation process which is undoubtedly giving precedence to the cities, the people I’ve found seem to have more of a salt-of-the-earth quality to them which you may never come across in the city unless you get to know a person a little more intimately. I was trying to think of all the instances where the people around here act differently to those in Seoul or Suwon, but then each time it just seemed to strike me as another over-generalisation that people always apply to the differences between living in the country and living in the city. It doesn’t really matter which city and country side town mouse and country mouse live in, the differences always seem to be the same. Perhaps it would be better to appreciate each for what they are and do our best to be happy with the decision we make about the places we choose to live in. I’ve always said that if I could find the right conditions, I would be happy enough to move out here and live. The city I love, and there is nothing to compare with it. But the countryside is equally essential. Knowing which one is more important to me though depends on what I am really looking for in my life, but also for my family’s life. I’m not sure if I can accurately assert which is the best decision yet. I grew up in a small town and felt that it was suffocating me, so if we did move here who knows how long I’d last before begging for life in the city again. 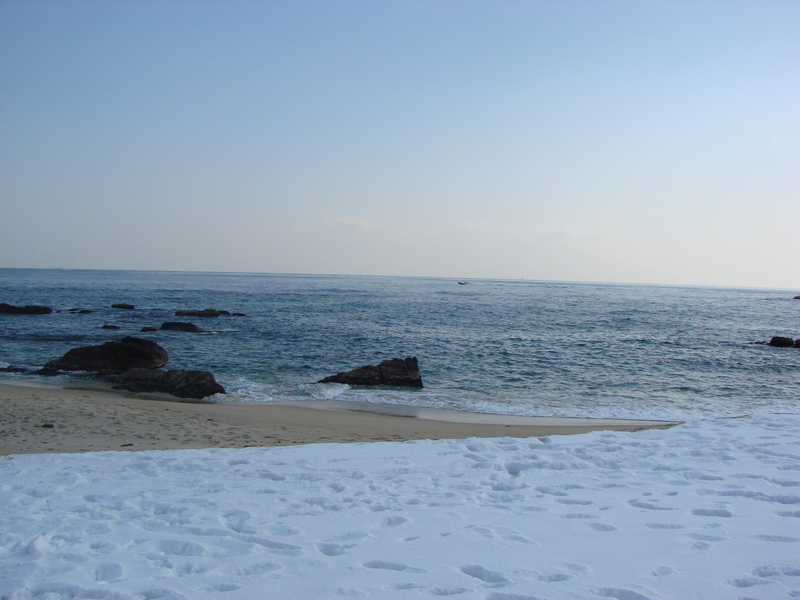 I’ve only every seen snow on a beach in Jumunjin. This entry was tagged Asia, beach, city life, coast, countryside, expat, family, fishing port, gangneung, gangwon-do, home, inlaws, Jumunjin, korea, life, lifestyle, living, Photography, rural, salt of the earth, sea, South Korea, town mouse country mouse. Bookmark the permalink. I enjoyed your article. I lived in the region myself for several years. I am not convinced that the river in your first picture is “Sogum River”. Originally, I, and many of my students in Gangneung, did think that. We also thought the hiking trail in Odaesan – just inland of Jumunjin – was called “Salt River” (Sogum Gang). No, it is “Little Gumgang” (So Gumgang) and is considered as beautiful as Gumgang Mountain in North Korea but smaller. In Korean, you don’t always put spaces in your sentences between words the ways we do in English so it is not clear if it should be “So Gumgang” or Sogum Gang” – Little Gumgang or Salt River respectively. Sorry for the Korean lesson. The river in Jumunjin might be Salt River and I look forward to having my uncertainty ended. I had a look and you’re actually right, it’s not Sogumgang. Sogumgang is about a Kilometre or two north of this river. My mistake. On the subject of being wrong, I just asked Herself (a.k.a. The Wife) and she told me you’re right about the little Geumgang aspect, and in fact rivers don’t really have names, except for the bigger ones of course. Greetings. I will be staying in Jumunjin for 2 weeks starting next Saturday (26 Jan 13) as an official at the Special Olympics World Games in Gangneung. It is difficult to find info on the town itself so I appreciate your posts. As there will be about 150 of us staying at the beach resort, wondering if you have any travel tips in terms of convenience stores, specific restaurant suggestions, etc. basically we are seeking things for small shops and entertainment in the off- hours, understanding this is not a major city. Thanks much in advance, best wishes! Hello Bruce, thanks for you comment and I’m very happy to help! The area around there is a little quiet but taxis are very affordable, especially if you have a group (4) and then its easy enough to get to and from different spots, many of which are only a short ride away. The town is quite old but it’s busy and there are plenty of restaurants (not everything is seafood but Jumunjin is quite famous nationally for its raw fish), cafes, shops, bakeries, and everything else (bars are a little different but they have them too). People are friendly, although English communication may be a problem. It’s worth exploring anyway. If the weather isn’t too intense a walk along the beach is well worth it. 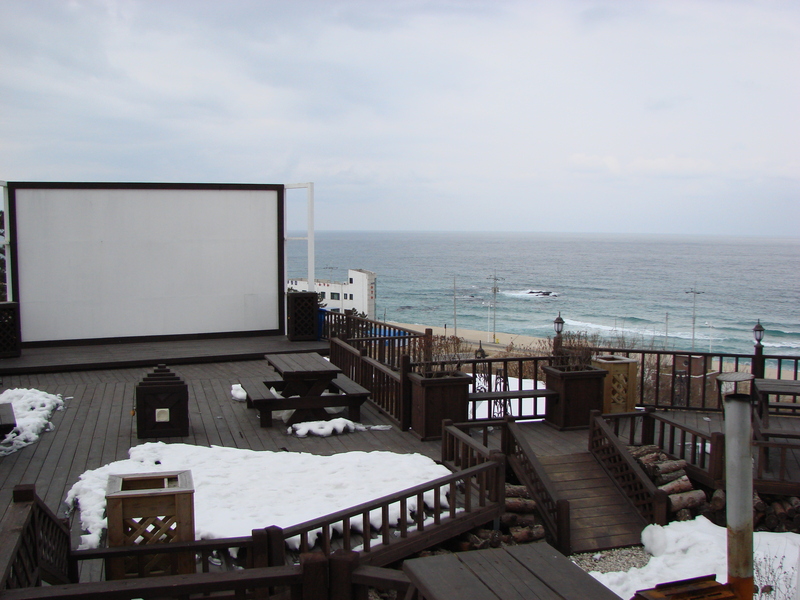 There’s another small beach area called Yeongjin – the opposite side of the town – which is a little more suited to hanging out on a cold day. Conor, thanks very much for the input! We are imdeed at the Jumunjin Beach Resort, very much looking forward to the trip and the SO World Games. Please feel free to stop by if you’re in the area; the Special O athletes are inspiring and there’s some great matches to be seen! Wonderful translator tech in the iPhone translates on screen from English to Hangul so taxis are easy and we find it a great way to learn useful phrases from a native speaker. In what ways are the bars different? Any etiquette we need to know? Hi Conor. Again, thanks for the info regarding Jumunjin. The Michelin guide made no mention but the maps at least gave context. Some friends of mine were in Korea nearly 40 years ago; they were telling me of the journey in the times of 23:00 curfews. In addition to our beach stay during the Games a few of us are going to Seoul for 4 days afterwards, staying in Gangnam district, looking to pack a lot of culture and food into those few days. Not big on fancy shopping or amusement parks (maybe just to see them) so any suggestions as to destinations in Seoul and outlying suburbs would be greatly appreciated! I am a Floor Hockey court monitor at the Games, just 1 of 6 so I should be easy to find should you and your wife find yourselves in town and would like to meet up. Report from the Games would be a great blog…it’s really a lot of fun! Yes Seoul is very different from Jumunjin, and Gangnam is all go, although the more cultural parts are actually on the other side of the river. Plenty to see in Seoul though. I’m actually going to meet the Irish team next week as I am neck deep with the Irish community (www.iak.co.kr). The games were a huge success when they took place in Ireland several years ago and my mother is still involved with the Irish team I think. As for the bars…well for starters the beer isn’t much to write home about (or it is if you’re looking to complain about something) and generally there designed for you to sit in your own enclosed table and many places insist that you order food, although this may be changing. They can be very smoky too – remember this used to not be a complaint about bars? Things change obviously. Anyway, they’re fine if you have a good crowd but not really for a quiet beer on the way home from work.